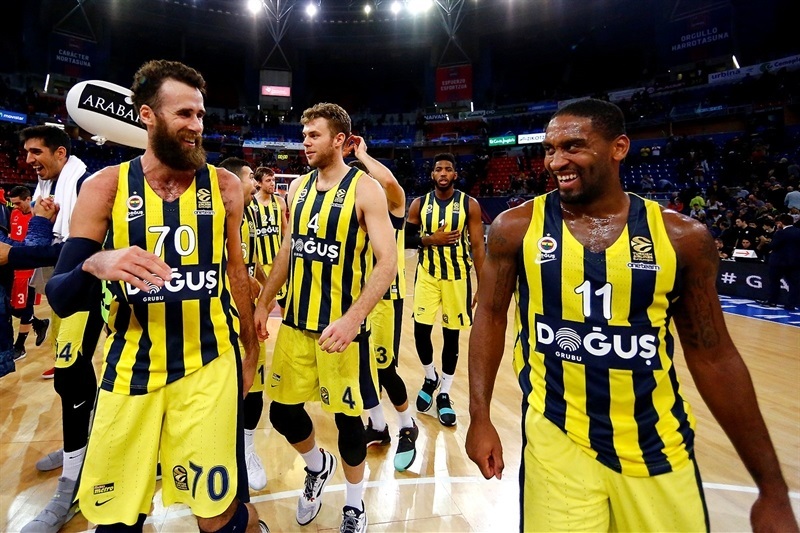 Fenerbahce Dogus Istanbul registered its third consecutive win by downing Baskonia Vitoria Gasteiz 69-83 at Fernando Buesa Arena on Thursday. 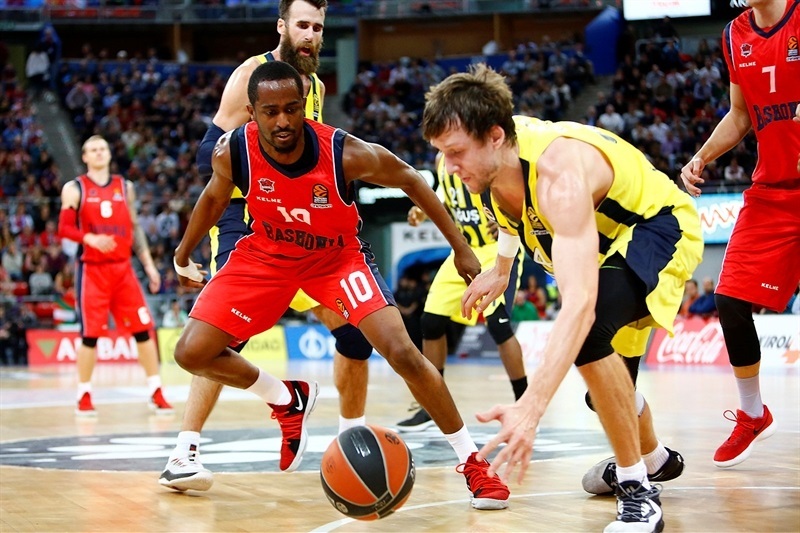 Fenerbahce improved to 7-3 in the standings while Baskonia dropped to 4-6. 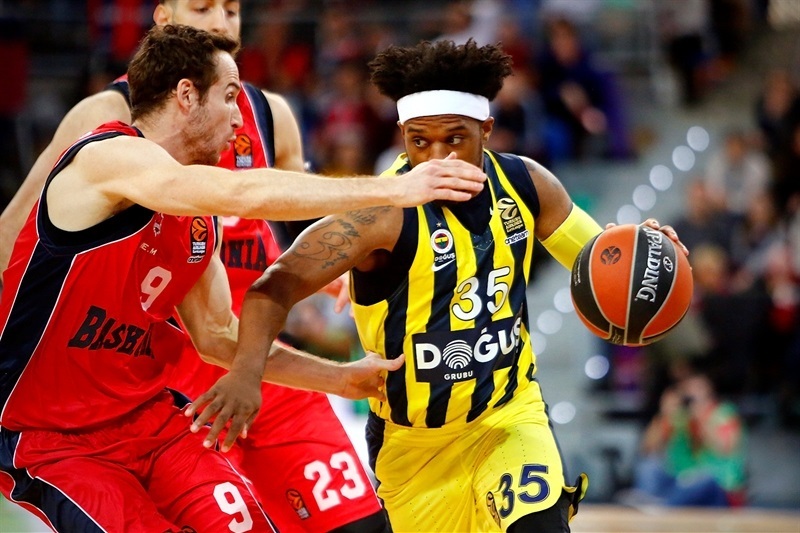 James Nunnally led six Fenerbahce scorers in double figures with 16 points. 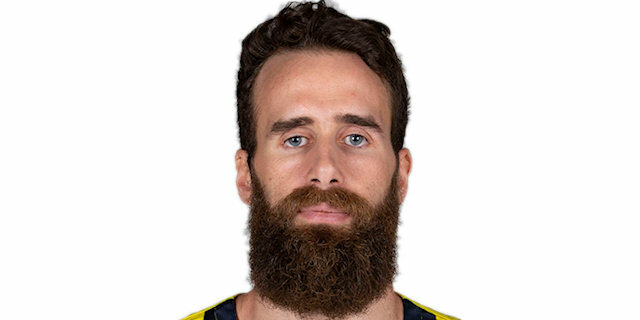 Kostas Sloukas added 14 plus 6 assists, Luigi Datome had 12 points, Brad Wanamaker 11 and Nicolo Melli and Jan Vesely each contributed 10 for Fenerbahce. 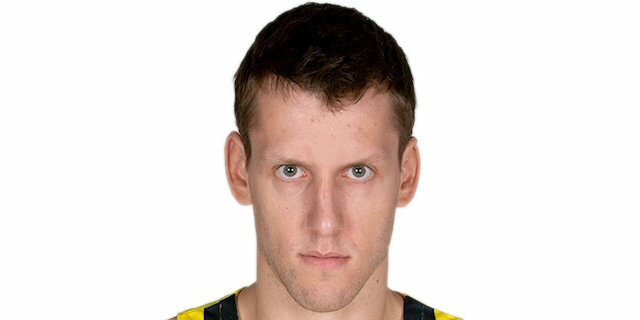 Vesely also chalked up 6 assists and 3 blocks. 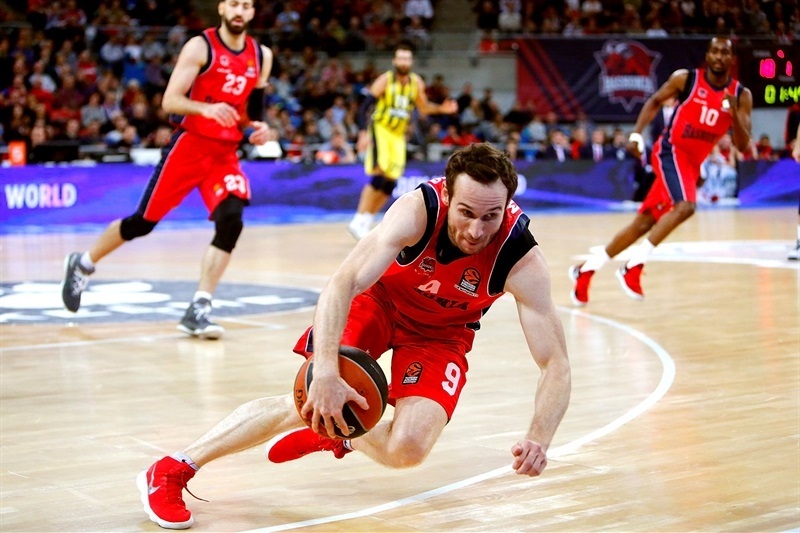 Toko Shengelia paces Baskonia with 13 points and Janis Timma, Marcelinho Huertas and Rodrigue Beaubois each had 10 for the hosts. Timma and Huertas each hit a triple in an 11-0 run that helped Baskonia to a double-digit lead, 25-15, after 10 minutes. Nunnaly and Vesely rescued Baskonia and a layup by Marko Guduric tied it at 35-35. 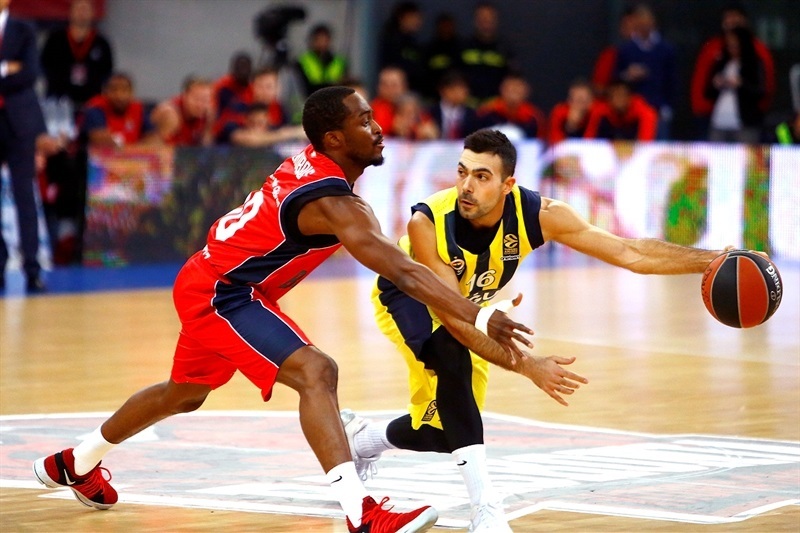 Wanamaker and Sloukas put Fenerbahce in charge, 37-41, at halftime. Nunnally took over after the break and got plenty of help from Sloukas and Melli to give Fenerbahce an 11-point margin, 49-60, late in the third quarter. 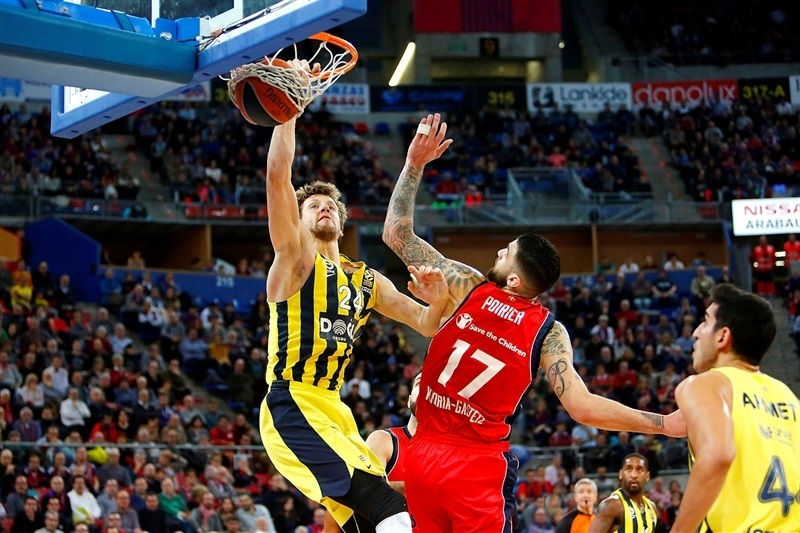 Melli kept pushing Fenerbahce and found help from Wanamaker and Datome to seal the outcome long before the final buzzer. 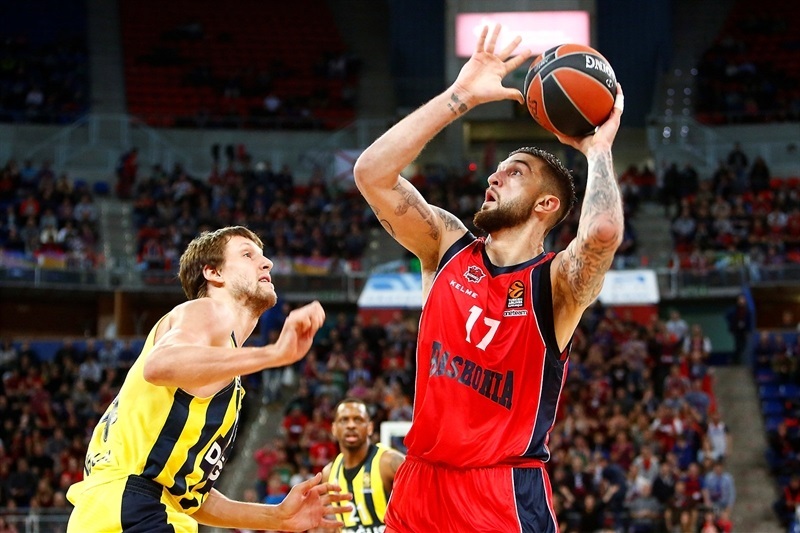 Vincent Poirier and Rinalds Malmanis scored down low to get Baskonia going, but a couple of layups by Ahmet Duverioglu and a three-pointer by Wanamaker gave Fenerbahce a 6-7 lead. Timma and Malmanis rescued the hosts with back-to-back three-pointers and Poirier added free throws for a 14-11 Baskonia edge. Vesely and Duverioglu shined with consecutive dunks, but Beaubois hit a jumper that ignited an 11-0 run in which Timma and Huertas struck from downtown to make it a double-digit game, 25-15, after 10 minutes. Shengelia ignited the crowd with a huge block and a couple of dunks early in the second quarter. He didn't find much help around, however, as Nunnally, Melli and Vesely caused Baskonia to call timeout at 29-26. Kevin Jones followed free throws with a couple of jump hooks to keep Baskonia ahead, 35-33, early in the second quarter. Guduric took over with a reverse layup, Wanamaker scored in penetration and free throws by Sloukas gave Fenerbahce a 35-39 edge. Shengelia and Sloukas exchanged layups to fix the halftime score at 37-41. Nunnally took over after the break with a jumper, a floater and a coast-to-coast layup, getting help from Datome to boost the visitors' lead to 41-50. 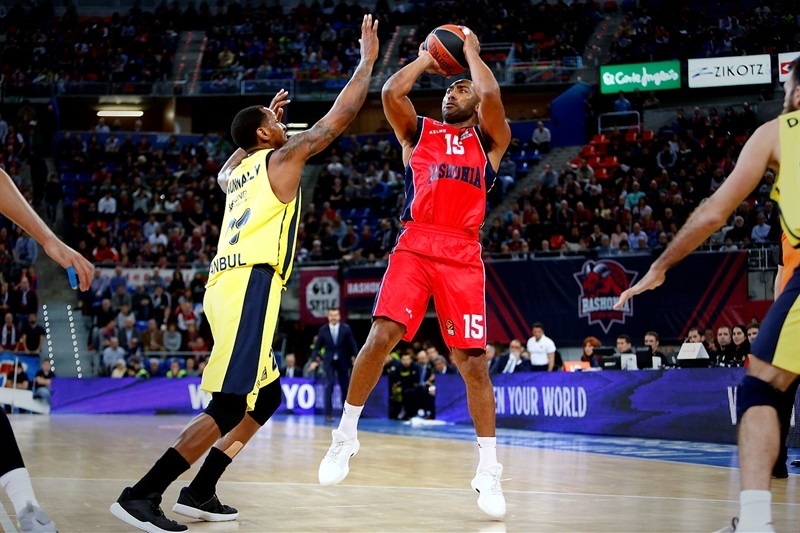 Timma and Shengelia tried to change things for Baskonia, but Nunnally, an unstoppable Sloukas and a dunk by Melli prompted the hosts stop the game at 49-60. 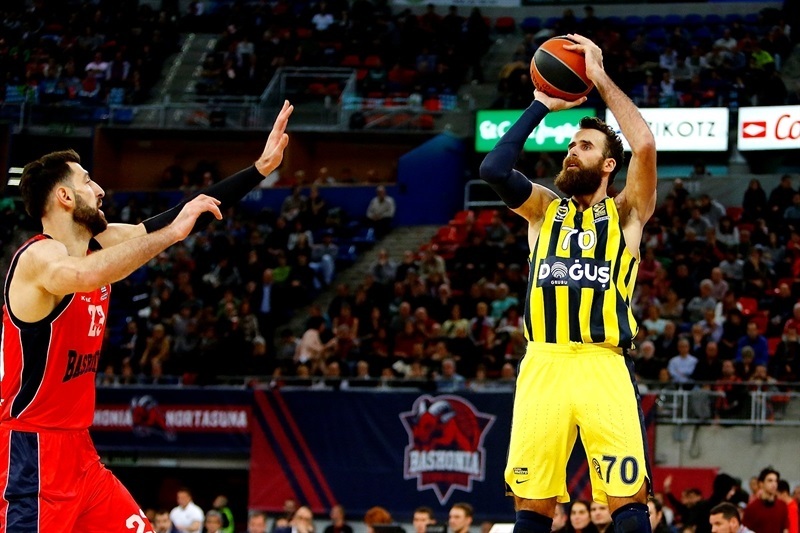 Melli stayed unstoppable to singlehandedly give Fenerbahce a 51-66 margin after 30 minutes. Wanamaker scored again and a triple by Datome kept the visitors way ahead, 56-71, with less than seven minutes left. 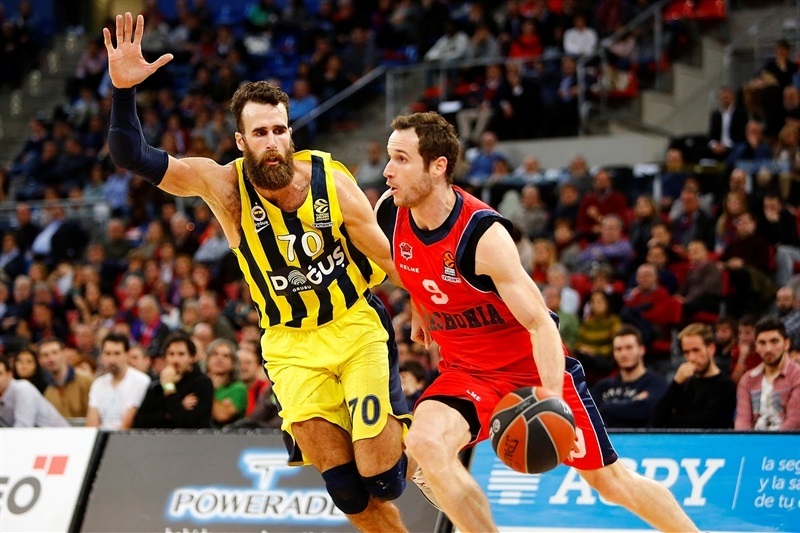 Baskonia kept trying, but back-to-back dunks by Datome and Wanamaker allowed Fenerbahce seal the outcome in style. "It was a difficult game for us. I think we started the game with a very good rhythm, making three-point shots, passing the ball in the right direction, but after the first 10 minutes, we had a lot of problems to move the ball and attack their switches on defense. We had some turnovers in the second quarter and allowed too many offensive rebounds. The second half was worse - we didn't play at the level that we expected. I think that obviously, we haven't lost because of one player, but as a team. We didn't find good answers against a physical opponent that plays very good defense. We were not able to find their weaknesses in general, only in some moments. They were able to hide those weaknesses and as a team, we lacked energy, physicality, played stronger and closer to the foul limit. We went down a little bit when we were not able to score, and you always have to try to give your best if shots are going in or not. Seeing Fenerbahce play well in the second half made us lose our confidence and prevented us from being positive. We played worse defense, worse offense and in some moments, I had the feeling we tried to win on individual actions, which is something that can happen, but it is not the smart choice. In that sense, against the best teams, you have to give answers playing as a team, not individually. What I missed was playing better as a team. Trailing made us be frustrated, it is obvious, and we cannot allow that to happen. We were also frustrated because their defense dominated the game. They made us take bad shots, pick up turnovers and not be comfortable on the court." "I believe that everybody who was over here last year saw that we had that game in our mind, the bad game we played over here. 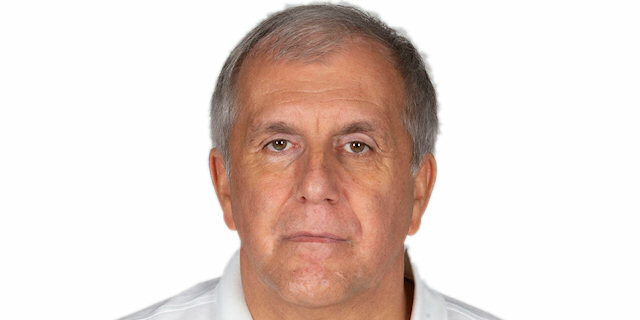 It was possibly our worst game in the EuroLeague, so everybody had that in our mind. It was necessary to show character, playing against a team that lately was probably in the best shape in the whole EuroLeague; the way they played was very impressive. I believe that, today, the key of the game was the second quarter. We changed our aggressiveness on defense and that helped us a lot. We played the same way in the second half and also were very smart offensively. The good thing is that we shared the ball and had a lot of assists, but in every game, we find some situation in which is possible to be better. However, thanks to my players for their job, congratulations for their victory and congratulations to my colleague Pedro Martinez for everything they did until now. 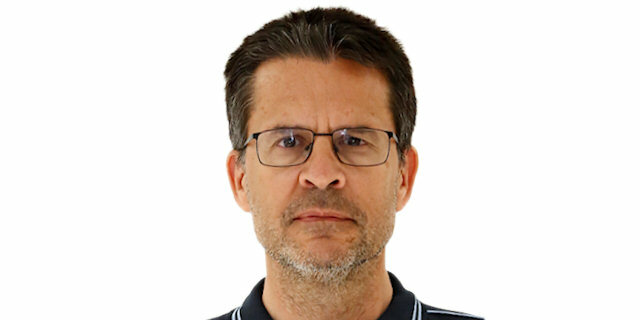 We played a good game and I believe that my players understand that – aggressiveness on defense and a good game on offense, but in some moments, in five-on-five situations, we are playing very slow. We have to change that and work on that, but you don't have a lot of time with the EuroLeague and the Turkish League schedule. This is a clear problem in our game. Some of our players were not here last season, but those who were here had it in mind, it was our worst game of the season. We came out with a different mentality, to play possibly our best game. 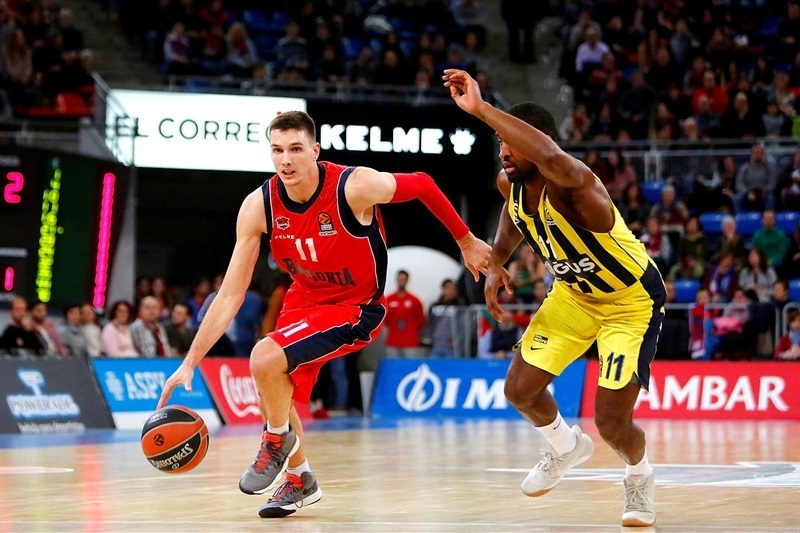 We knew it was a difficult challenge because of everything going on in Baskonia right now, playing at a very high level since Pedro arrives, scoring a lot of points, 90-92 per game in the EuroLeague, with all players with a lot of confidence. When you play against a team like that, you need to play an almost perfect game to win." "It is a difficult court where to win and I think we played a very good basketball game most of the way, let's say after the first quarter. I think everybody did his job, sticking to the game plan. Everybody tried to help each other and we fought, so it was a very, very big win, very important for us." "We won the game. That is the important thing. We played great for three quarters and it was a good game. We played focused and fought. It is a long season and we have a lot of games in front of us. It will be a lot of fighting, a lot of games, a lot of minutes, so we will fight for everything and play our game."